“Smile in the mirror. Do that every morning and you’ll start to see a big difference in your life”. A smile can show the world a person’s happiness, contentment, sincerity, confidence or even love. When you look in the mirror and smile, do you like what you see? Many people don’t and often refrain from smiling or cover up their smiles because they are self-conscious about what they see in the mirror. Fortunately, periodontists can work in conjunction with your dentist to offer solutions to these and other cosmetic issues. Sometimes a person’s teeth appear to be too short or like baby teeth. The teeth may actually be the appropriate length, but they are buried in too much gum tissue. The periodontist can correct this by doing a procedure called Cosmetic Crown Elongation. Crown elongation exposes more of the natural tooth and can make a world of difference! Missing teeth can cause more issues than just black spaces in the smile. When a tooth is lost and not replaced, other teeth can start to shift in the mouth. This can change not only the appearance of teeth, but also the bite. The jawbone will also start to melt away if there is no tooth root in a space. Bone loss can change the overall facial structure as well. Partials and bridges are options for tooth replacement, but both neither of these options prevents bone loss. A partial often contributes to loosening of other teeth or to dental decay. In order to place a bridge, healthy teeth have to be cut down to nubs and crowned to support the bridgework. The most effective and conservative way to replace teeth today is with Dental Implants. Dental implants look, feel and function like natural teeth. And they will never decay! 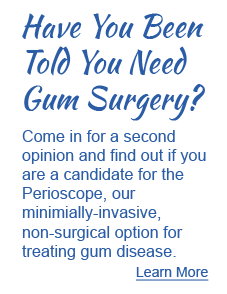 Gum recession is most often caused by overly vigorous brushing! A periodontist can fix this problem with Root Coverage Grafting. Tissue from the roof of the mouth or from a donor source can be used to cover the receded area, restoring a natural gumline as well as providing protection from root decay. You may have heard the expression “long in the tooth” referring to the cosmetic changes we see with recession.